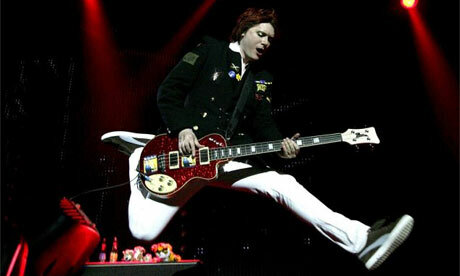 The blog site New Chart Riot are currently collating votes for a “top 50 Manic Street Preachers” song so I thought I’d join in with the fun. As can be seen from one of our past polls, the Manic Street Preachers are a band that split opinion amongst the Wizards. I love em but Kicker can’t stand em and Rebel is somewhere between those 2 extremes. Kicker’s chief complaint about the Manics seems to be that the lyrics don’t fit with the music and you can hear me making a pretty ham-fisted attempt to explain why that doesn’t matter on podcast 12. Like James Dean Bradfield, all those singers have distinctive and idiosyncratic singing voices so if you can’t get past the fact that you find the voice irritating then I’m not going to try to convince you you’re wrong. Even though you most definitely are! Anyway, here’s my top 50 in reverse order with a bit of nerdy data analysis at the bottom. For each song, I’ve put my favourite bit in brackets. Also have a listen to the Spotify playlist below. Halfway through the countdown. That calls for a celebratory scissor kick! So there you have it. 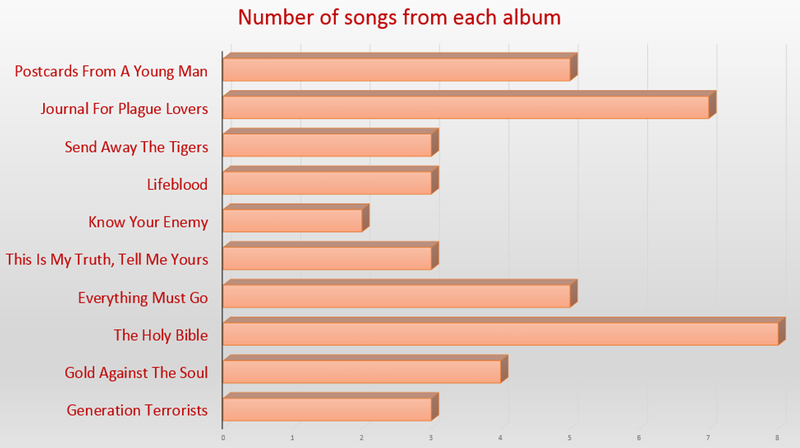 A quick totting up of the songs shows that The Holy Bible and Journal For Plague Lovers are definitely the most popular, the last album had some really good songs on it and Gold Against The Soul is better than Generation Terrorists. All author’s own opinions though, it’ll be interesting to see how much the final votes from New Chart Riot correspond with mine. Lastly, I just wanted to mention how it’s great to see a contemporary band who have put out so many great “non-album” tracks, rather than just alternative versions. There were 2 non-album singles in my top 50 (Masses Against The Classes & There By The Grace Of God) and 5 non-album b-sides. When choosing the songs for the top 50, there were loads of non-album b-sides that just missed the cut so just in case you’ve never heard them, check out Close My Eyes, Unstoppable Salvation, Black Holes for the Young, No-one Knows What It’s Like To Be Me, Happy Ending, Mr Carbohydrate, Comfort Comes, Welcome To The Dead Zone, Just A Kid, Askew Road and Fearless Punk Ballad. And to finish here are my 2 favourite Manics covers. 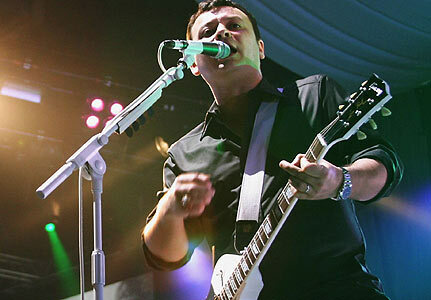 Tell us your favourite Manic Street Preachers songs by leaving a comment below. Posted by chorizogarbanzo on August 4, 2013 in Blog posts, Spotify playlists, wizards choice and tagged best, james dean bradfield, manic street preachers, spotify playlist, wizards choice.